Now you can disinfect while making your bathroom sparkling clean. Clorox<sup></sup> Disinfecting Bathroom Cleaner kills germs commonly found in the bathroom. This bleach-free formula has been proven to dissolve soap scum before your eyes. In the bathroom or kitchen, nothing cleans with the ease and power of CLR Bathroom & Kitchen Cleaner. A Power-House foam spray cleaner that instantly removes calcium and lime deposits, scale and discolouration from countertops, appliances, bathtubs, toilets, sinks, fibreglass, tile and glass. Ready-to-use cleaner with a strong, grease-cutting formula. Non-abrasive and non-acidic; won?t bleach grout or damage tile. Cuts through grease, dirt, food and soap scum on tile grout, chrome, glass and laminates. Leaves a fresh citrus scent. For marble, granite and stone, use the appropriate StoneSpecific<sup></sup> cleaner. TileLab<sup></sup> biodegradable formulas are designed to break down quickly and naturally in the environment. This No VOC (Volatile Organic Compound) formula helps to provide better indoor and outdoor air quality compared to similar traditional products. Ready-to-use cleaner and resealer. Non-acidic, non-abrasive formula wont damage stone, grout or tile. Cuts through grease, dirt, food and soap scum on tile, grout, chrome, glass and laminates. Contains TileLab<sup></sup> SurfaceGard<sup></sup> Stone, Grout & Tile Sealer to reseal as it cleans. Leaves a fresh citrus scent. TileLab<sup></sup> No VOC (Volatile Organic Compound) formulas helps to provide better indoor and outdoor air quality compared to similar traditional products. Bleach Foamer Bathroom Cleaner Now you can disinfect while making your bathroom sparkling clean. 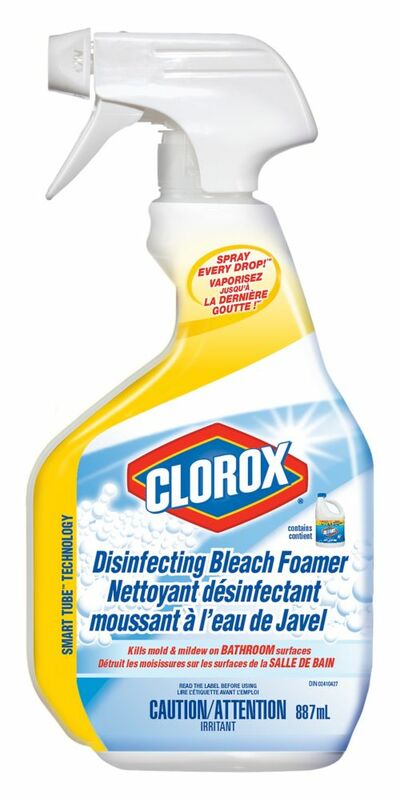 Clorox<sup></sup> Disinfecting Bathroom Cleaner kills germs commonly found in the bathroom. This bleach-free formula has been proven to dissolve soap scum before your eyes.